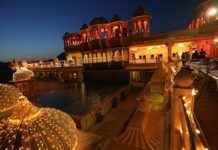 In this blog, you’ll find a list of all the best resorts in Udaipur, mentioned in no particular order. Resorts could be considered as the ‘ideal escape from respective routines’, situated away from the hustling-bustling air of the city. These resorts are meant to provide our minds a stress-free timeout for few hours and energize us for the upcoming routine days. The idea of an exemplary resort must include a vast swimming pool amidst vast green valley and warm cottages or cozy rooms to stay in; also the most essential element must be ‘Peace’. 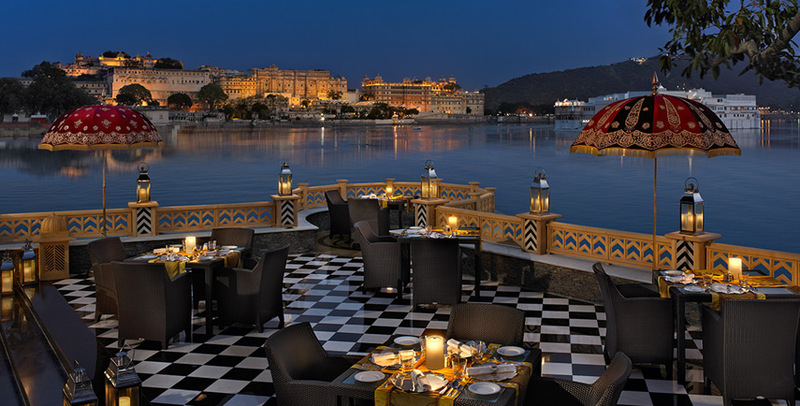 Udaipur, being one of the most beautiful cities of world is surrounded by the scenic Aravali valley and to add stars to its grandeur the mesmerizing lakes. Some best resorts in Udaipur and Resorts near Udaipur have therefore been blessed with the natural beauty already! 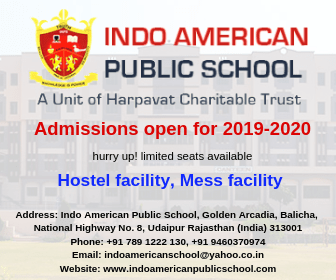 Note: The list below has been created on the basis of reviews and ratings of residents of Udaipur and mentioned in no particular order, this is an unsponsored blog. My Udaipur City believes in generating unbiased content. It is situated in the Nai and Sisarama Villages in Udaipur district, the location provides the peace and vividness one craves for in a resort. There are several activities that can be experienced provided by the resort including bird watching, village safari, trekking, mountain walking, swimming in the pool, and body massages. As this is a boutique resort, therefore you’ll find all the modern amenities in the rooms. The Heritage Resort is situated near the renowned Eklinji Temple which is a major attraction for tourists and holds a lot of religious value for the locals. Therefore, if you’re planning a visit to Eklinji Temple, plan a night stay or a day out at the Heritage Resort and experience the Mewar Cullture preserved by the resort. Activities like fish watching in the Lotus Lake nearby, watching migratory rare birds, dipping into the history by touching the ancient carved walls of the temples nearby, or just chilling in the swimming pool and sipping beverage in the vast green gardens of the resort; can be cherished. 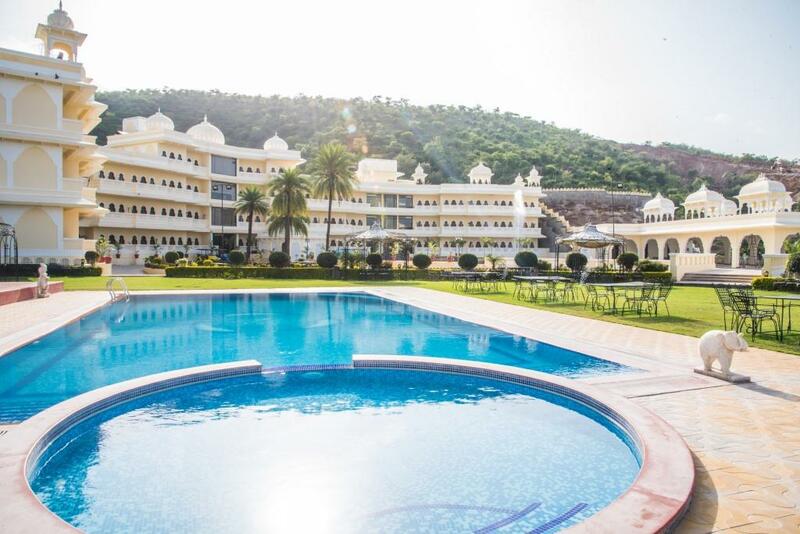 Vantara Resort & Spa belongs to the elite franchise of Tree Leaf Hospitality; this is one of the 5-star properties of Udaipur situated at a distance of 12 kms from the Udaipur city. There are mere 16 hideaway rooms studded with natural Jaisalmer stones that act as a perfect hiding spot from the city aura. Activities offered by the resort includes meeting the village tribals, cycling around, teaching the village students, yoga, meditation, cooking together with chef in the outdoor cooking station, and stress relieving spa session. 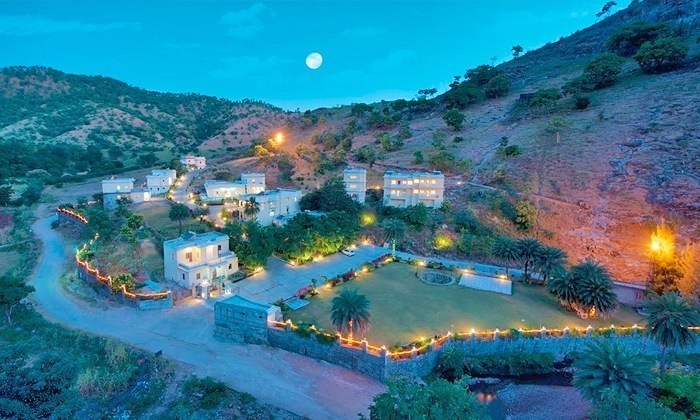 Located on top of one of the Aravali Hills is a luxury resort: Bhairavgarh; the architecture of the resort is inspired by the Mewar Palaces and equipped with all the modern facilities. The main experience you’ll acquire by visiting Bhairavgarh will be the idea of living with the history. It can act as a great wedding venue for hosting a history enriched royal wedding. One can stay into the authentic Rajasthani architecture designed rooms; enjoy the aerial view while swimming in the outdoor pool, avail a spa and sauna session at Bhairavgarh resort. 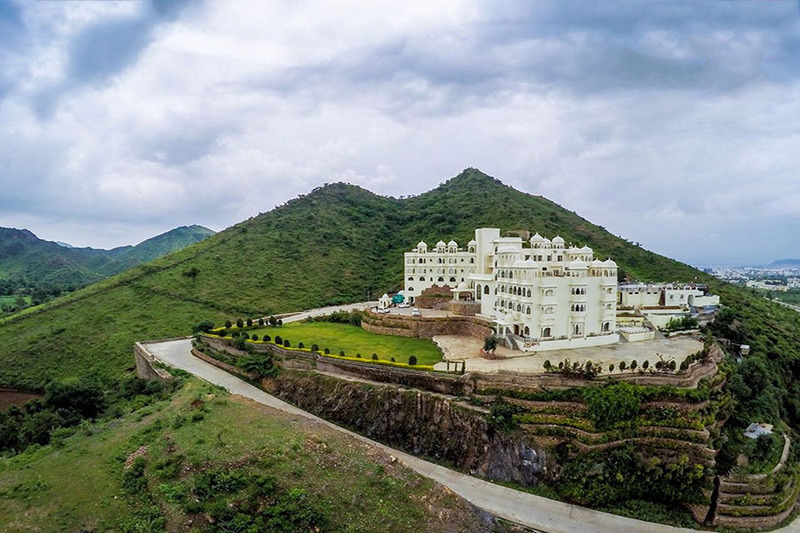 Belonging to the renowned franchise of jüSTa Hotels & Resorts, jüSTa Sajjangarh is located at the backdrop of the Sajjangarh Biological Park, giving a brief view of the Sajjangarh Palace (Monsoon Palace) perched on top of a hill nearby. Unlike most of the other resorts in Udaipur that are inspired by the Rajasthani architecture and serving royalty, this resort will welcome you with modern wall paintings and graffiti. Spa, Sauna, Massages sessions can be taken at the Welness Centre; whereas football, darts, and board games can be played in the gaming section. Swimming Pool and Gymnasium can also be experienced at the resort. 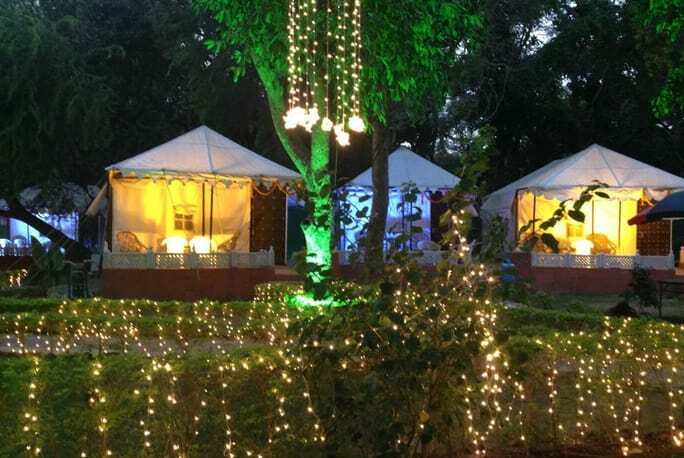 It is a tent themed resort, created in order to provide the guests an experience of the amalgamation of the Mughals and Rajput culture, as the Rajput and Mughal Emperors used to go on hunting expeditions quite often and for accommodation preferred tents in the woods. 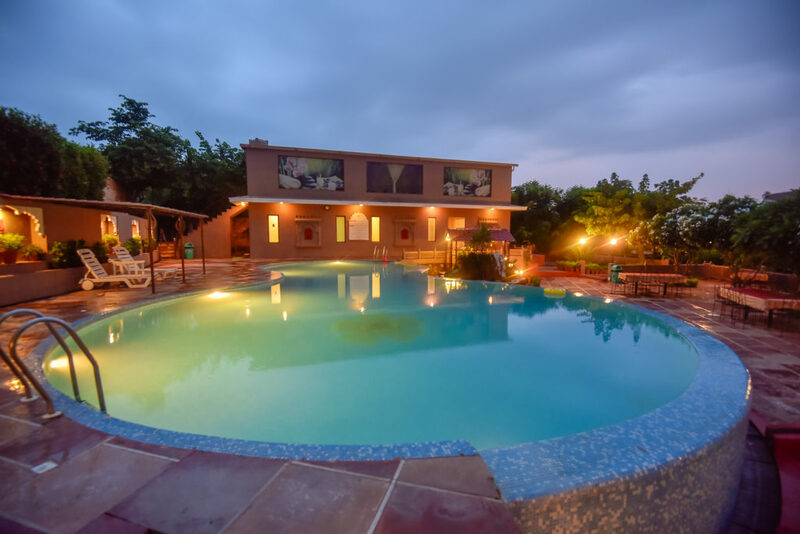 Activities that can be indulged in the Aravali Tent Resort include sleeping under open skies, camp fire, camel safari, horse safari, jeep safari, trekking, and meditation. However, there is no swimming pool available in the resort; therefore it makes it appropriate for the chilly nights to stay in. 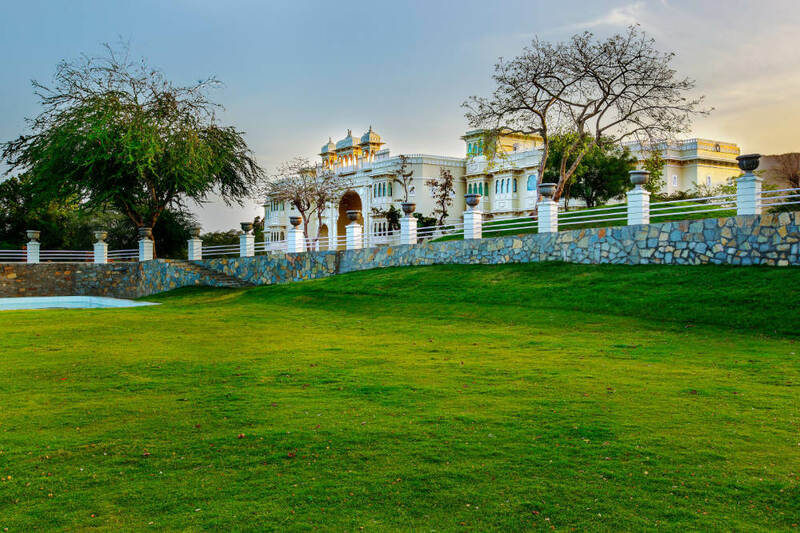 If you cherish and aspire to live or spend leisure time in the palaces of Mewar, then Shourya Garh Resort & Spa turns out to be the best option or we can say one of the best resorts in udaipur for you as this resort is a total replica of the historical palaces spread over huge acres of land. There are 24 garden and luxury rooms in the resort in which some of them acquire a featured private terrace and bathrooms with atrium ceilings. 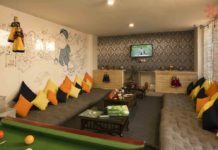 Other services that can be availed at the resort include swimming in the indoor pool, gymnasium, spa experience, village excursion, supervised kids play area (with indoor table games), outdoor slides, and game courts for volleyball and badminton. Spread across 75 acres of land, this resort is a contemporary resort providing 5-star luxuries. As the resort covers huge area of land, there are cabs available to take you back and forth from your villas to the restaurant, wellness center, swimming pool, and for other activities. It is well renowned for its vast swimming pool and multi-cuisine restaurant that serves all the lip-smacking authentic cuisines. There’s also a golf course, kids area, fitness center, and indoor games room available for leisure. Experience the culture of Rajasthan by the hand-picked artifacts showcased at the Royal Retreat, one of the top class and best resorts in udaipur, we could surely call it a hub of Rajasthani creations as each room is loaded with unique handicrafts and are connected through royal art flooded walkways around the swimming pool. The resort owns its own horse stable, which makes it a dream place for the people who cherish horse-riding. Other facilities like the gaming room, fitness center, and a spa is also available at the resort. Ever dreamed of a private waterfall inside the resort premises? Well, Aaram Bagh owns the idea of ‘Forest Experience with luxury’, the rooms and the main building is inspired from vedic history and gives out a royal feel. Services like Jeep Safari and Stream garden can be enjoyed by the guests; also as the resort is rich in the flora quotient, one can trek on the nearest mountain and go for a hiking expedition nearby. One can also visit the nearby Chandani Village that surely will provide you the peace you require away from the mind bobbling city feel. Another replica attempt of the royal Mewar Palaces, this resort is situated away from the city on the Eklinji/Nathdwara road. One can enjoy a dip in the vast swimming pool along with the delicacies provided by the resort, also workout in the fitness center, or get relaxed in the on-site spa, or burn some calories in the squash and badminton court. The resort is also working on the indoor gaming zone that will soon be inaugurated with several board games and fun activities. 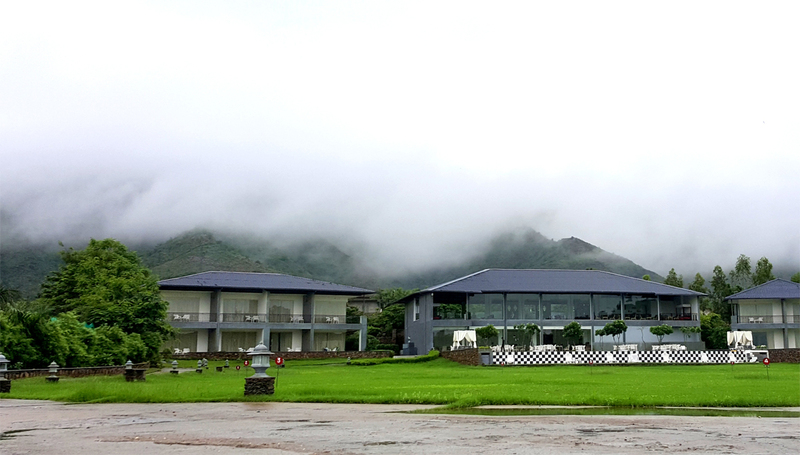 As the name suggests, Amargarh Resort is also a heritage resort of Udaipur located on the Ahemdabad – Udaipur Highway. This resort is an appropriate hideout from the city as the natural aura and the historical walls of the resort take you in another dimension, a peaceful one. It is one of the best places for a destination wedding as it contains a lawn of 54,000 sq. ft. 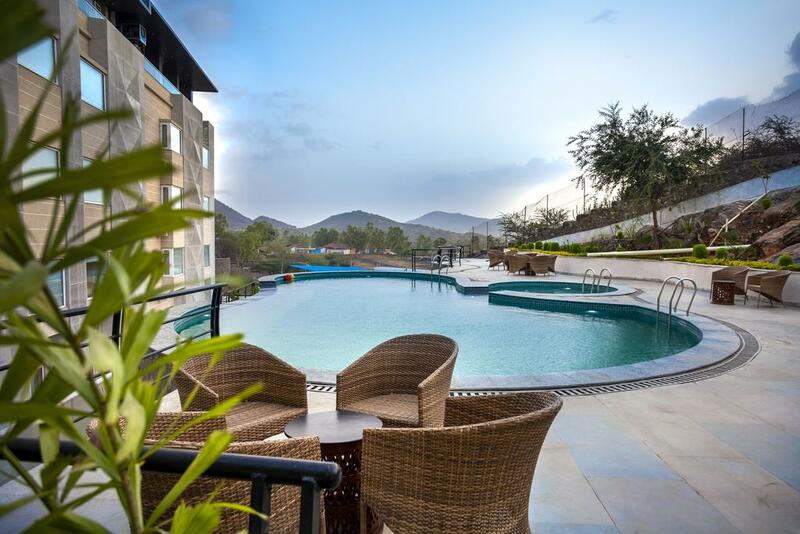 This resort is also one of the best resorts in udaipur & ideal for a pool party of friends and family. 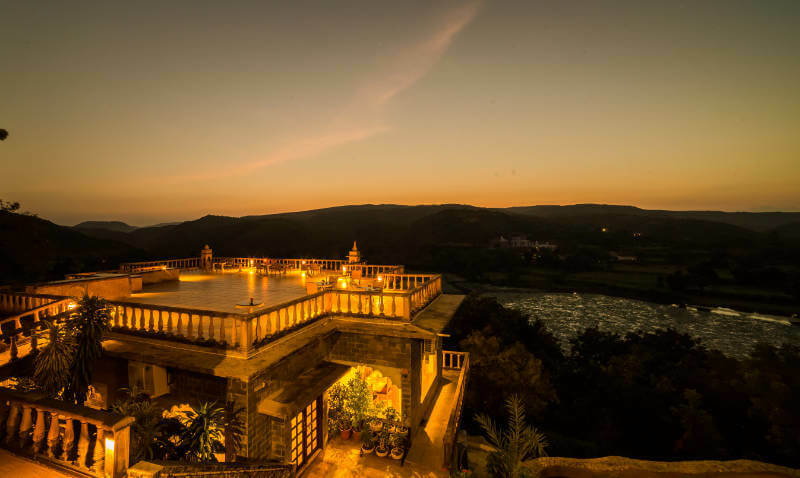 The word ‘Tatsaraasa’ is a Sanskrit word that means calm, charming, and beautiful; as the name suggests Tatsaraasa Resort & Spa indeed is located at an extremely tranquil location near the Lake Lakhawali, in a village near Udaipur. One can go for cycling in the nearby village and also visits the fields and dig up vegetables. There is also a gaming zone available both indoor and outdoor. If you’re a keen bird watcher then you must opt for this particular resort as there are several rare species of birds that can be spotted at the resort like Grey Heron, Pied Kingfisher, River Tern, Wire Tailed Swallow, and several more. Are you an adventure person? Seek adventure activities in resorts as well? Well you’ll surely get some adventure at the Amantra Shilpi Resort like Zip-lining, high rope course, tire hurdle course and a lot more. 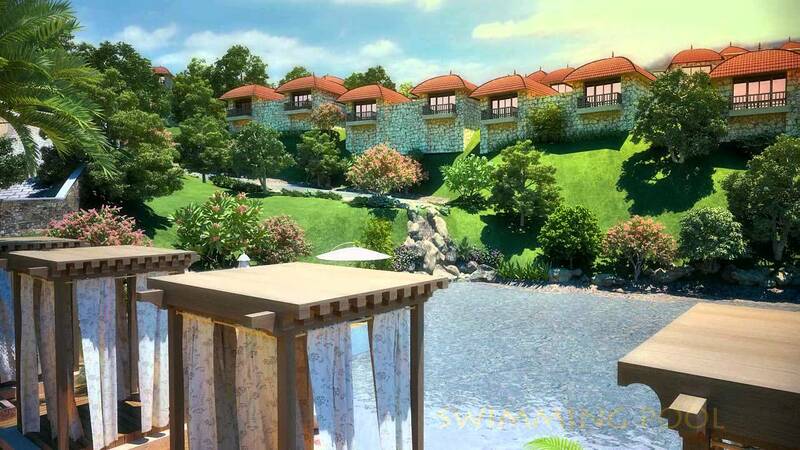 Other amenities offered by the resort include Swimming Pool, Spa, Disc, and Travel Desk. One can avail a bicycle from the resort and go for a ride near the scenic Fateh Sagar Lake on Rani Road. This resort is one of the well-known and best resorts in udaipur. As the name suggests, there is a deep relation of the resort with bamboos, as there is bamboo plantation within the premises of the resort as well. There are 25 uniquely designed villas available at Bamboo Saa for accommodation. Also other services include swimming pool, spa, natural play space and open to sky bathtub. There can also be workshops arranged by the resort on storytelling, entrepreneurship, art, soft skills on special requests. Board game options are also available at the resort along with the Foosball table. 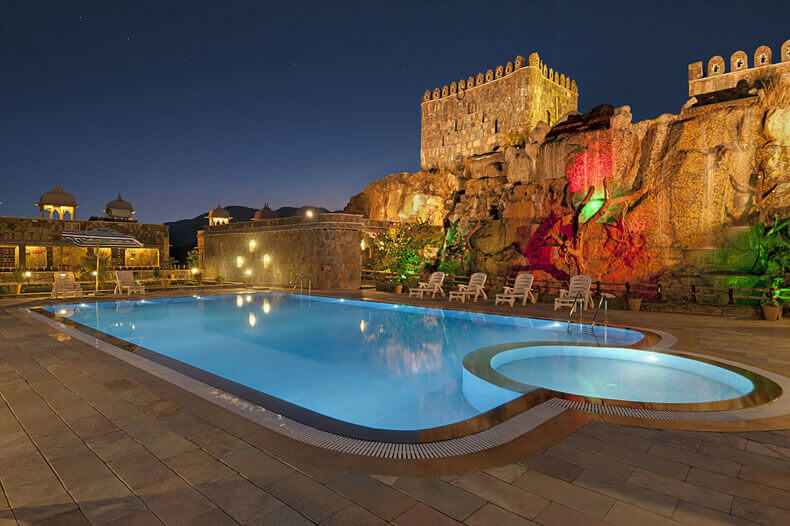 Found your ideal best resorts in udaipur the list above? 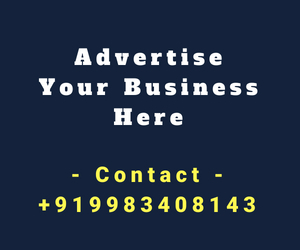 Convey us your thoughts about the blog, whether it was helpful or not through comments, this will help us in improving and building our blog. If you think we’re missing out a decent resort in Udaipur, kindly let us know their names in the comment section below along with appropriate reason of them being featured in the above list. 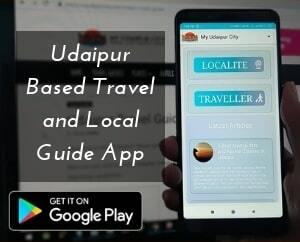 Don’t forget to like, share, and subscribe to My Udaipur City. Send in your queries, opinions and suggestions via comments.